Oh, my! It’s becoming the sort of story that no longer rates much notice in the American media. Hassan Shalabi, 14, was shot in the chest, and the other teenager, Hamza Shtewi, 17, was shot in the neck. 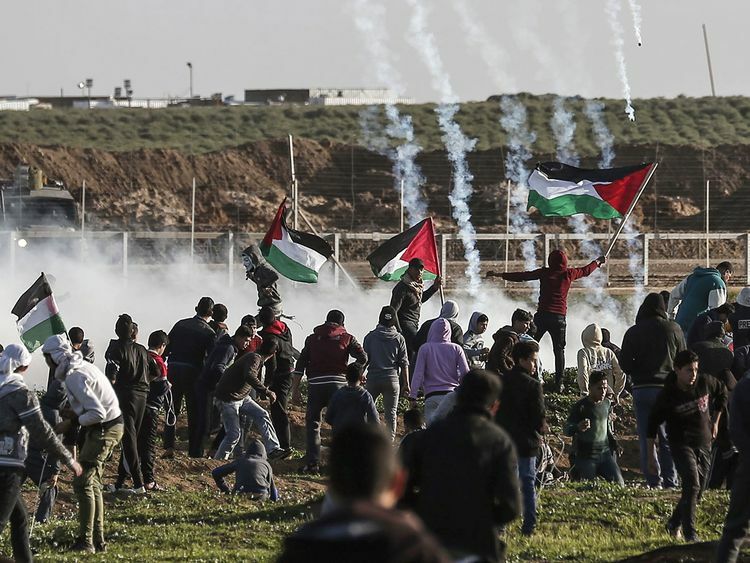 At least 16 other Palestinians, including two journalists and four medics, were injured. Reportedly, 240 Palestinians have been killed and a mind-boggling 23,000 others wounded since the Great March of the Return protests began on March 30 — Day of the Land, which celebrates the heritage rooted in the land shared by Palestinians everywhere — and was meant to last through May 15 — Day of the Nakba, which commemorates the day Palestine was dismembered and its people displaced — but the protests have continued non-stop. The Great March of Return is a teleological phenomenon that begs for philosophical conclusions. For close to a year now, we have watched Gazans gather in the tens of thousands at the border separating their tormented strip of land from their ancestral homeland, and we wondered what propels men and women — in this case, often youngsters — to join a protest where they know they will most probably die, and die in pursuit of a cause they know they are not going to be around to see triumphant, much in the manner of a Romantic nobleman preparing for a duel on a cold morning, who knows that his life might be about to end. Is it that love of freedom is stronger than the fear of death? Is it that, when you have nothing, you have nothing to lose? Is it that, when you are not given the right to choose how to live, you find yourself left with the right to choose how to die? I have wondered why these Gazans — to many of whom, as descendants of refugees, the horrors of the Nakba are a haunting experience, indivisible from their own identity — keep coming back to the border, week in, week out, to mock death, as it were? And there’s that other mystery to ponder: Have you wondered, as I have, why Israeli Jews remain determined to wantonly kill Palestinians, harass them from the earth and put on their backs the same burden of ancient loathing that diaspora Jews had endured at the hands of Gentiles over the centuries? It is not difficult, really, to explain why these Palestinians keep returning to the border in the tens of thousands to take part in the Great March of Return, undaunted by the risk to life and limb. Ever since 1948, Return, or Awda in Palestinian idiom, is a word that has come to have a mastering grip on Palestinians’ semantic fashions of expression. To Palestinian ears it is a word welded at the whetstone of dispersal and otherness, that bespeaks of a yearning for historical redemption. It is a word, in short, that resounds around every corner of every Palestinian’s being. And that is what scares Israelis: There’s a people out there with solid claims to historic Palestine, a people imbued with the will to return, who continue to insist that the accounts between them and Israel do not balance. Someone will one day listen. History will one day dictate its imperatives. There are many Israelis today, free of the hatreds, latent hysteria and reservoirs of venom built into the Zionist mindset, who have tried to impose on their political culture the humane sobriety of the liberal Jewish tradition inherited from the diaspora. But these Israelis have been dismissed by their society — a society of ever increasing kitsch and messianic tawdriness — at best as eccentrics or at worst as baying wolves. All of which of course degrades those progressive Jews who, since the 1850s, had contributed mightily to all that is liberal and humane in the western intellectual tradition, and today continue to contribute immensely to the glory of the sciences, cinematic art, literature and scholarship in the Euro-American world. Meanwhile, next Friday, the Friday after next, and the Friday after that, Palestinian returnees will be at the border — undaunted by the risks, I say, with freedom-loving people around the world taking their hats off to them — to assert their identity, and thus cause a crisis in that of Israelis. No matter that the Washington Post will pay scant attention to all that.